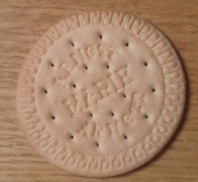 The Marie biscuit, as I am sure everyone knows, is named after Marie Alexandrovna, the daughter of Czar Alexander II of Russia and wife of Alfred, the second son of Queen Victoria. Such was the excitement over the 1874 royal wedding between Marie and Alfred that bakers Peek Frean created this biscuit and named it after her. Apparently Marie was quite a sensation, insisting on being called ‘Her Imperial Highness’ and generally lording it over the then Princess of Wales (much to the annoyance of Queen Victoria). Now I have to say that either the excitement over Marie was not really up to how it is described in the history books, or else Queen Victoria was determined to snub her and had a work with Mr Peek (or perhaps Mr Frean) . What else can explain why, when commemorating such an memorable royal wedding, that Peek Frean created such a boring biscuit? Just a plain old flour-and-vegetable-oil affair, with nothing more than a hint of vanilla to add some interest. I mean it’s OK, and perfectly adequate as a snack. But as a way of commemorating someone who was simultaneously a Russian Grand Duchess, a British Royal Duchess and a Sovereign German Duchess it seems pretty mean – just a few swirls around the edge to give it a regal air. I’m going to give this biscuit five out of ten, including a bonus point for historical significance. I got that flat feeling today. On the way back to the office from a meeting I turn the penultimate corner prior to my destination, and it feels all weird. Like the back wheel skidded out a little.I continue to roll along, and the weird feeling continues. It just all feels wrong, like some alien force is trying to take over the bike. I pull up outside the office, and feel the tyres. Sure enough, the rear one is nearly flat. I have a puncture. Bugger. ‘This can’t be!’, I think. ‘I never get punctures!’. It’s kind of true. I haven’t had a puncture for about four years – ever since I started riding on Conti Sports Contact tyres. I’m not really one for brand endorsements, but I love those tyres. I guess they travel about 5000 km per year, so that’s 20,000 km without a puncture. And they are grippy and fast too. I get up to the office to survey the damage. I also have a quick check of the equipment I have with me; I am now so complacent about punctures that I quite often neglect to take any of the basics with me. Tonight I am in luck, though. I have a repair kit, tyre levers, a new tube, and the all important spanner to get the wheel off – it’s the rear wheel on the fixie, so it doesn’t have a quick release. The first challenge is getting the wheel off. I hardly ever do it, and the last time the nuts were tightened were at the LBS. For a few minutes I wonder if my little spanner is going to give me enough leverage, but with some brute force they turn. I examine the exterior of the tyre, and immediately see the culprit. A tack is embedded in the rubber. I’m surprised that the tyre didn’t go down much faster; I must have ridden several hundred metres with it pushed into the wheel. The good news about it being so obvious is that I can repair the tube easily, as I know where the hole is. I lever the tyre off the rim at that point, and pull out enough of the inner tube to carry out a repair. I have a sudden thought that the puncture repair kit might contain a four-year old tube of dried-up rubber cement, but luckily it’s unused and the seal is not broken. Rough up the tube with sandpaper (repair kits seem to come with little cheesegrater things these days, but I prefer old-school and evidently remembered to put a small square of sandpaper in the repair kit) and apply a coating of rubber cement. Then wait. And wait some more. And then just a bit longer for luck. 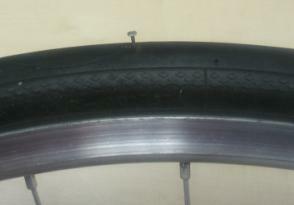 Put a little air into the tube and relocate it, then pop the tyre back onto the rim. Check the tube isn’t being pinched by the tyre bead, and then inflate the thing properly. This is where things get a little difficult. I do have a mini-pump, but I’ve never used it. I purchased it ages ago when my previous one fell off my bike and was squashed under a car before I could retrieve it. My old one had two holes, one for Presta and one for Schrader. This one has only one hole, apparently for Schrader. And there’s an adapter thingo clipped under the lever. I have no idea how this works. I know such adapters exist, but I’ve never used one.What do you do? Put it into the pump, and then onto the valve? Screw it onto the valve and then put the pump over? Do I use the lever on the pump before or after inserting the adapter thingo? I actually still don’t know the right way, but I do know one thing. The answer to ‘how do these adapter thingos work’ is ‘badly‘. I tried it every which way, but each time I got a moderate amount of air into the tyre any subsequent thrusts of the pump wobbled it enough to cause more air to leak out than I was pumping in. At this rate I was going to be riding home on a tyre barely inflated enough to keep me off the rims! I eventually worked out how to get some air in, by jamming the wheel upright under my desk with the valve at the top, and then pulling upwards very hard on the valve as I pumped. A manoeuvre that could be tricky at the side of the road. Perhaps I need to invest in a better pump. Anyway, I do actually quite enjoy mending punctures, provided it’s not at the side of the road in the rain when you are late. I like the satisfaction of actually mending something that is damaged – a feeling that is rather rare in today’s disposable society. I know several friends who think I am bonkers, and just buy a new tube each time; I’ve been known to rescue their punctured tubes from the bin, repair then, and present them back to them to use next time. Not that I’m looking to get another puncture any time soon, thanks. But in another 20,000 km or so’s time I might be ready! 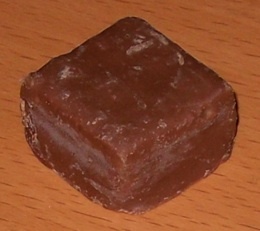 Representing a kind of foray into the no-mans-land between biscuits and chocolates, these small square biscuits are designed for snacking, presumably whilst watching the teevee. They come in a rather smart box reminiscent of the packaging those miniature version of chocolate bars come in, so it’s a clear assault on that category that Arnott’s are making, rather than the regular biscuit market. I did for that reason ponder whether to review them or not; however I was heartened by the small print which declares ‘160g net biscuits’. Arnott’s might be trying to confuse the issue with the ‘snack’ nomenclature, but it seems the legal department insisted that they were indeed biscuits, and had to be marked as such. The variety that I sampled was ‘wafer bites’ . This may seem odd when you consider my prejudices against wafers, but this slightly damaged, dented packet was 30% off at my local supermarket and I am a sucker for a bargain. They are packed in a cellophane bag inside the box, and I recommend that you empty this bag out into the cardboard prior to eating. Partly because it makes the whole business of reaching in to take out a teevee snack much easier and more fun, and partly because it means you then have to finish the whole box. 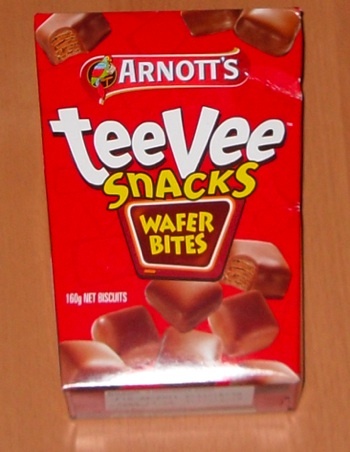 The teevee snacks in my sample box looked a little the worse for wear; certainly not as smooth and rounded as the box artwork suggests. This may be to do with the rough handling the box had endured. However, it didn’t affect the eating quality of the teevees. I have to say, I thought they were rather good. They are a lot like small pieces of Gaiety, but actually I think nicer for being smaller. It’s certainly very easy to chomp through a whole boxful. In fact, I think these are one of the nicest wafer biscuits I have had recently. I’m going to give them an eight out of ten. Great excitement! Stop the presses! On an expedition to the supermarket last week, I found something new and exciting in the biscuit aisle – a new line of Tim Tams featuring dark chocolate. Obviously Arnott’s have taken heed of my advice around dark chocolate, and decided to expand their repertoire. There were two different varieties on offer, both decked out in a sophisticated livery; ‘Mint’ and ‘Run and Raisin’. I chose the mint, although you can be assured I will be returning to the Rum and Raisin variety in a future post. I chose mint as I was intrigued to see how it fared against the Mint Slice. The Mint Slice is awesome, and I’ve rather controversially declared that I prefer it to the Tim Tam. However, could this preference be overturned by this new minty Tim Tam? The first thing to note is that, in common with other ‘prestige’ varieties of Tim Tam, you only get nine in a packet, as opposed to eleven. This just rankles a bit with me, to be honest. Come on Arnott’s, give us a fair go and give us a full pack every time. Once past that small disappointment, the Dark Mint Tim Tam is revealed to have an alluring minty aroma. It’s classic Tim Tam; thick dark chocolate enrobing two crumbly biscuits sandwiched together with a rich cream. The cream filling is not white, like the Mint Slice, but a rich mint-flavoured cocoa cream. And they are good. Very good indeed. The balance of mint and chocolate is just right and the biscuit and cream filling work together perfectly. Oh yes, these are very good. Maybe even the best Tim Tam I have tasted. They are very rich, and very moreish. I’ve been meaning to try this for a while; ever since it was raised over a year ago on SydneyCyclist. How quickly can you ride up Awaba Street, possibly the steepest street in central Sydney? I’m not much interested in how fast I go, but of course I did have another much more intriguing thought. Could I get up it on the fixie? Awaba Street stretches for about 500m from the lovely Balmoral Beach up to Spit Road in Mosman. At its steepest the gradient is nearly 30%, and over it’s length it rises about 70m. It’s not far from where I work, although I’ve never been there. Until now. On Sunday I got out for a ride, and I decided the time had come to tackle it. 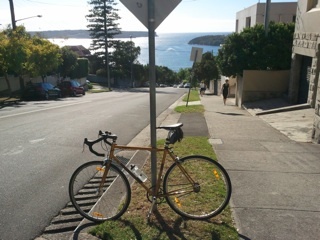 I rode out to Mosman, and took a route that would bring me to the foot of Awaba Street. I didn’t want to ride down it; I wanted to contemplate it from the foot of the hill – and then attempt the ascent. From the bottom, it didn’t look too bad, to be honest. I’ve ridden the fixie up into the Blue Mountains, through the Northern Beaches, climbed out of Coogee – and this didn’t look much different. But then again, I remembered the descriptions people had posted online about it – descriptions from fit cyclists who ride every weekend – and they seemed to think it was something special. Nothing for it – I was going to have to give it a go. I rode back a few metres along the promenade, and then turned to get a bit of a run up. Unfortunately my run up was foiled by a lady who decided to cross at the pedestrian crossing right at the bottom just as I got there – so my rolling start came to nothing. Oh well, just get on with it from a standing start. Up we went, and the beginning part wasn’t too bad. Cruisy, in fact. I was out of the saddle, but was making good progress. However, after a hundred metres or so, I started to realise the cruelty of this hill. The gradient gradually increases – so as you get more tired and slower, it gets steeper. Things started to get difficult; my cadence had dropped to very sub-optimal levels and I was really grinding – and we weren’t even half way up. Was I going to have to stop? Possibly. I dived into a side turning, and rode around in small circles three of four times to regain some energy. Then back to it. Ouch – this was getting really quite hard. It was a real effort to get the pedals over the top each time; the veins on my neck were standing out as I forced then round. This was no good. A quick look back over my shoulder – no traffic. I put in three or four zig-zags across the road; gaining height at a slower rate but mercifully easier on the legs. Then a car starts to approach, so I have to go back to grinding straight up. I’m really gasping now, head down, sweat dripping off me. I dive into another side street, ride ten metres or so on the flat, turn around and ride back, gathering some speed and then back onto the hill for the final push to the top. It’s in sight now, and the better cadence and motivation from seeing the end point give me enough energy to get to the top. My legs fell like jelly, but I got there. You may have noticed that this blog has been rather light on the ‘books’ element promised in the title recently. This is in part because I have been reading much less since Baby Chillikebab came along (unless you include such erudite titles as ‘Ducky says Quack!’ and ‘ABC Zoo’), and in part beause what books I have been reading have not really been worth reviewing. However, I did get this book from one of my favourite authors for Christmas, and have finally got around to reading it. This is a selection of essays based on the themes and questions AC Grayling tackles in his numerous newspaper columns. There is a real mixture of things in here, from religion to food, from Shakespeare to soap opera. The point though is to provoke thoughts; to provide a framework for considering the world and to perhaps see things in a different light. 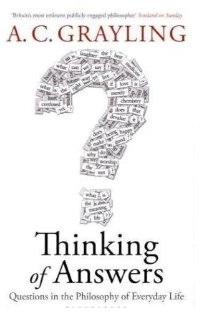 It’s an easy read, but it does a great job of showing why philosophy (and the related discipline of critical thinking) is so relevant to the way we live our lives – and how our lives are enriched and our horizons stretched merely by taking some time to actually think about stuff. As Socrates said, the unexamined life is not worth living, and this book helps prompt perhaps a little more of that examination. A couple of weekends ago it was Baby Chillikebab’s first birthday, so we had a party. We baked a stupidly big cake, which Baby Chillikebab wasn’t allowed to have. We also supplied cold drinks to the guests (well, the adult ones at least), so in the morning I set out to get ice. It was a very hot weekend, with temperatures well over 3oC. Finding somewhere that still had ice was surprisingly hard, especially as the bottlo was not open at that time on a Sunday morning. Eventually I found a garage that had some, and then had that dilemma about how much to buy. I ummed and ahhed, and eventually got four bags. I knew this was going to be too much, but part of me just wanted to load up the Radish with loads of ice. Each bag weighs 5kg, so there was a bit of weight – and my loading was not very even, as I didn’t want to crush, freeze or moisten the bread rolls I bought from the baker. They also clonked and moved around rather as I rode along; it was all rather reminiscent of having a passenger. Still, I got home fine, and am now able to add ’20 litres of water’ to the list of things I have carried on the Radish. 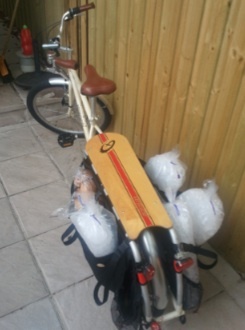 I did buy too much ice, by the way. One bag went completely unused. I also bought too many bread rolls. Such is life. When I was younger, we used to go to an Indian restaurant that did a ‘meal deal’ where you got a starter, main and dessert for some ridiculously cheap price. It was good too; perhaps tandoori chicken to start, then a beef rogan josh with rice to follow. Pudding was always the same though – a single scoop of vanilla ice cream, sprinkled with hundreds and thousands. Except there weren’t hundreds and thousands; usually you got three or four. Very occasionally five. We used to wonder about this; how painstakingly the staff must have taken a tiny pinch of hundreds and thousands from the pot to put on each dessert. No doubt a catering pack of them lasted the restaurant for years. 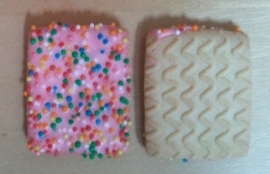 Arnott’s are not so frugal, however, on their ‘Hundreds and Thousands’ biscuits, as each biscuit has about three hundred of them sprinkled on each one, held in place by the thick pink icing. 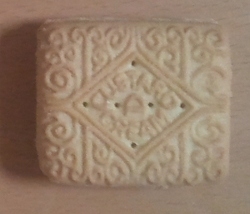 The back of the biscuit is given over to a wavy line pattern, a bit like a TV set that has gone on the blink. The blue pack and cartoon graphics immediately alerts us that these are part of that range aimed at children. (Well, aimed at parents for their children, I suppose. As a public service announcement I feel I should point out that feeding sugary snacks to your kids is not recommended. I say that, although Baby Chillikebab is already eating marmalade on toast, and is only ten months old, so I daresay she’ll graduate to biscuits sooner rather than later.) The immediate thought here is that these are going to be very sugary and unexciting, although we’ve been surprised before. Unfortunately, in this case, we were not surprised. They are very sugary and unexciting. The combination of the icing and the hundreds and thousands do make them quite crunchy, and they have quite a strong vanilla taste, which puts them ahead of the nasty Tic Toc. But only a bit ahead. These get just three out of ten.